As much as I dislike the mess, the history of my kitchen has me intrigued. 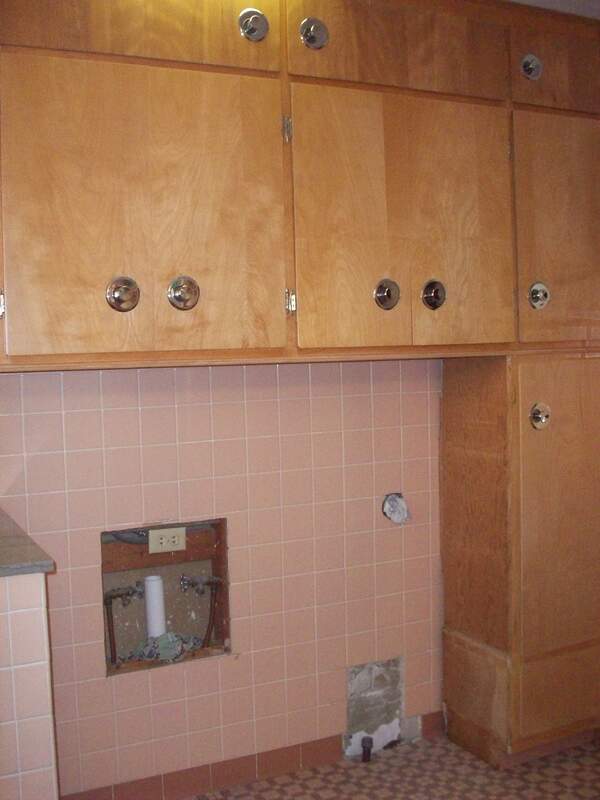 How cool (and many times sad) to find what is hidden behind the years of upgrades in our Mid-Century modest home. Hubby is busy extending the soffit in the kitchen to accommodate the new upper cabinets. 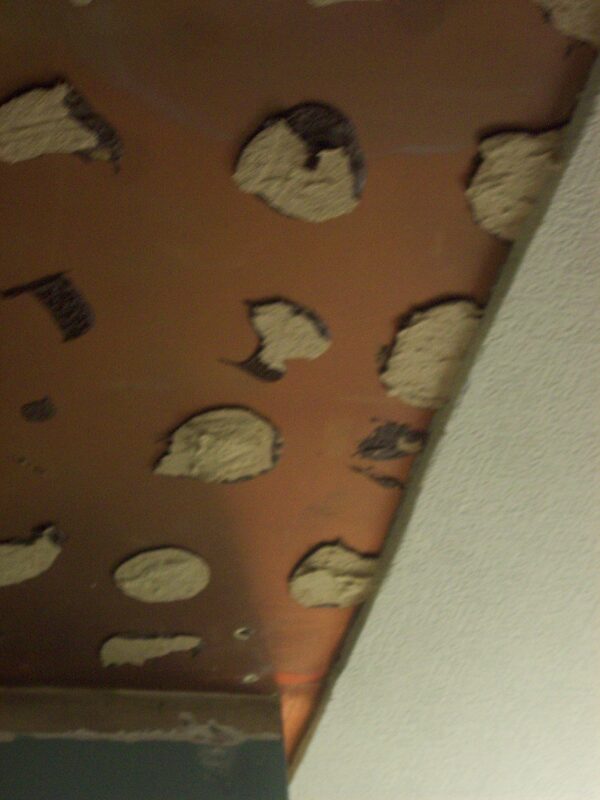 A few of the older (we thought original) ceiling tile had to be removed. What we found was that the ceiling had been painted shiny copper at one time! 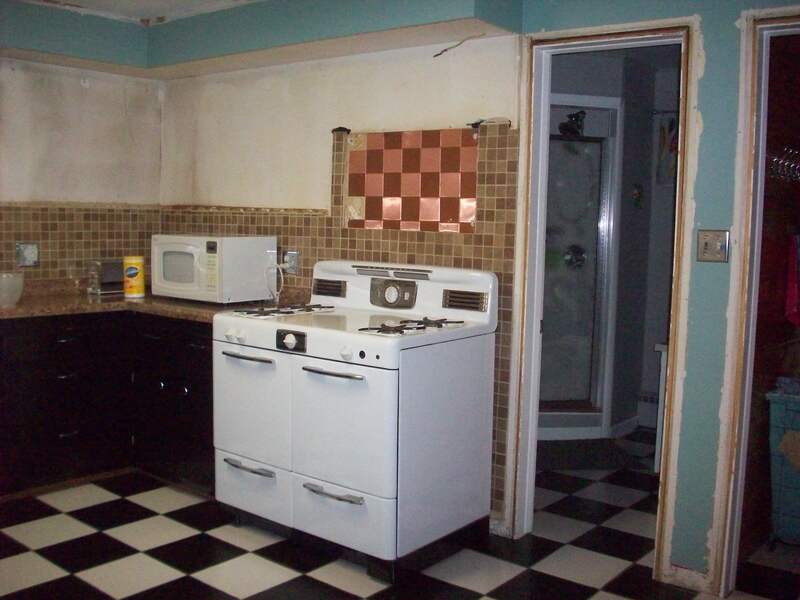 Maybe it was painted to match this copper tile back splash that was also hidden long ago? 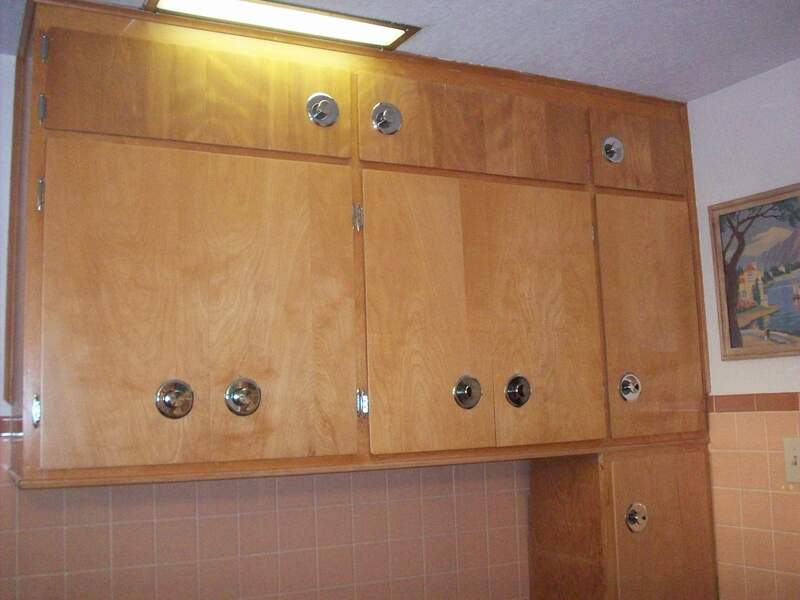 You can see part of the original varnished upper cabinets before they met with a paint brush. I bet they looked pretty spiffy with that copper tile back splash, a copper painted ceiling and the adjoining knotty pine mud room! 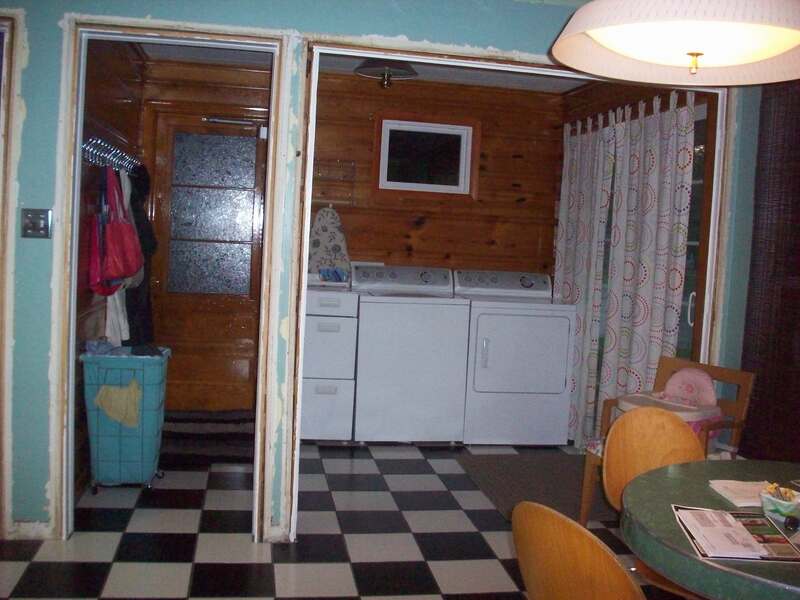 I like to imagine that it had copper Colonial style lighting, cool bark cloth curtains and maybe copper or black colonial hardware on those pretty wood cabinets. Maybe the Mrs. here had copper canisters? Or maybe a weather vane wall hanging? We think the smaller doorway to the left was added later? I cannot imagine the original plans called for a single doorway within inches of a double doorway. 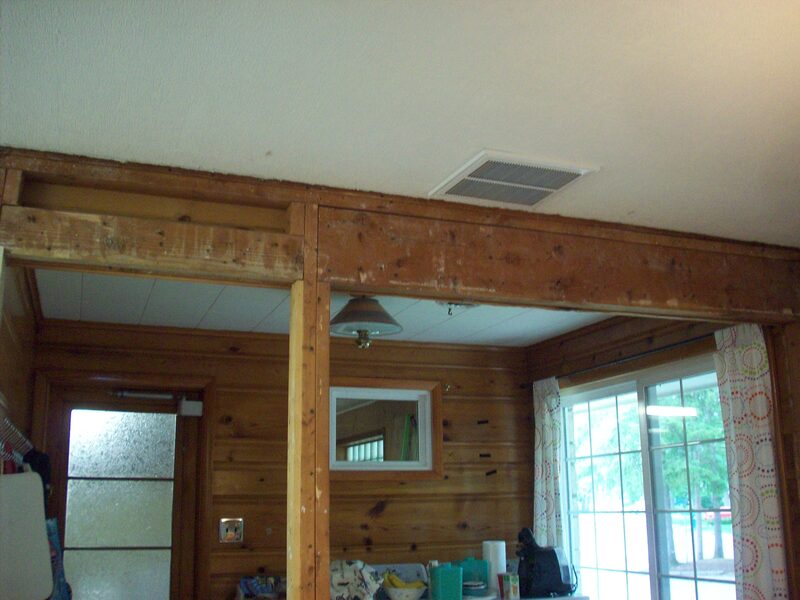 All of the plaster had to be removed so the contractor could see what he was dealing with structurally. The header will have to be replaced so we can remove that center post. 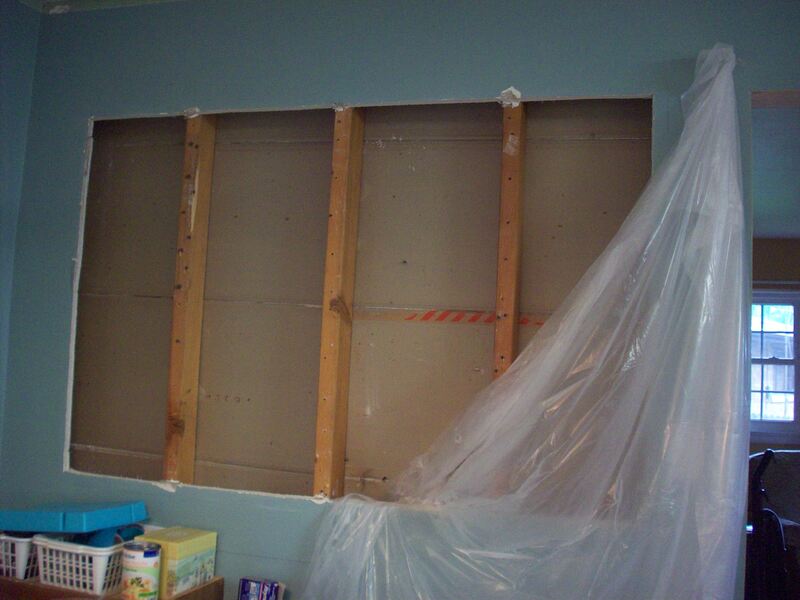 This wall is going to be opened up to the living room to accommodate a snack bar area. We will then be able to view the fireplace from the kitchen and it will help with serving when we are entertaining. The bar top will match the retro patterned Wilsonart counters going in the kitchen. 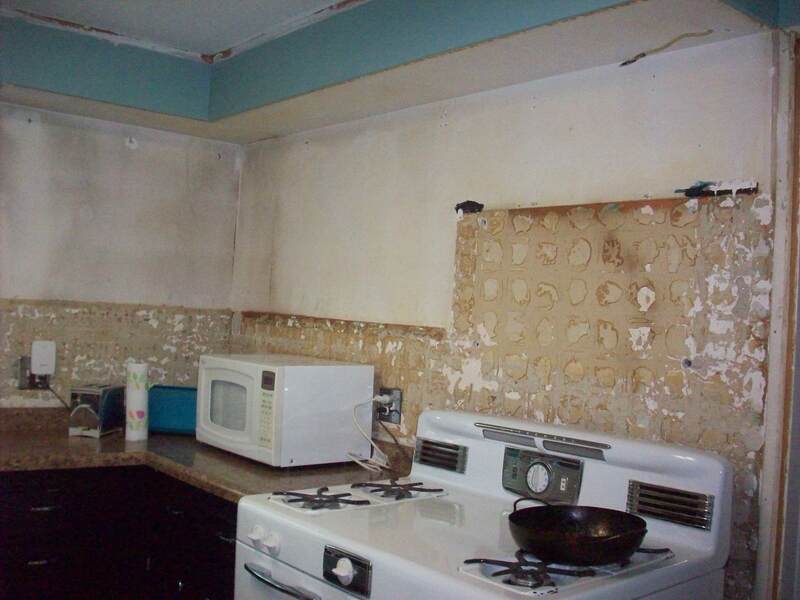 All of the beige back splash tiles came down, along with much of the plaster behind it. The walls will have to be repaired. We will be using the same Wilsonart laminate for the back splash. 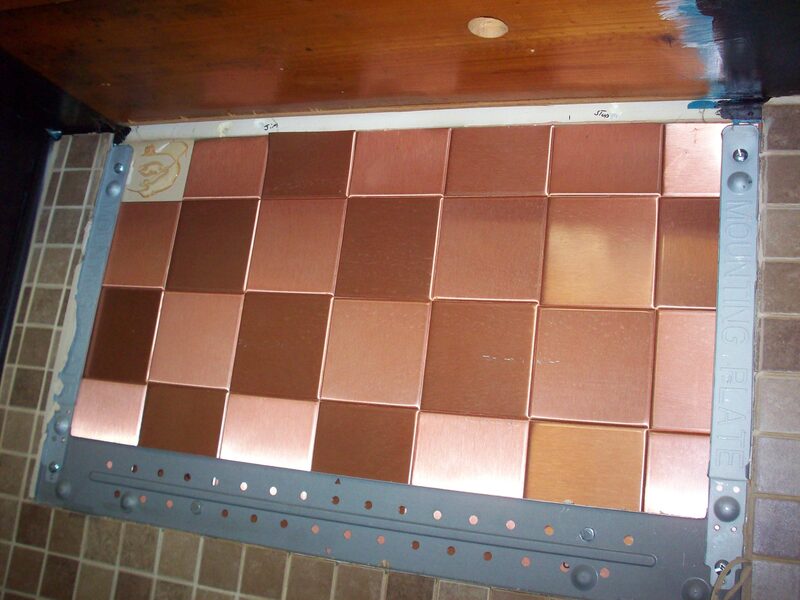 Has anyone ever seen copper painted ceilings (or walls)? Was that a common mid-century finish or maybe just something done on a whim by an adventurous homeowner? Things are moving along here at the ranch, albeit a little slowly. Hubby is trying to do much of the work himself, while our easy going contractor juggles multiple jobs and stops in to direct Hubby and save us money. The plumber has nearly finished his work. While we had the mess he installed another air conditioning vent in my large kitchen area and added another air return. 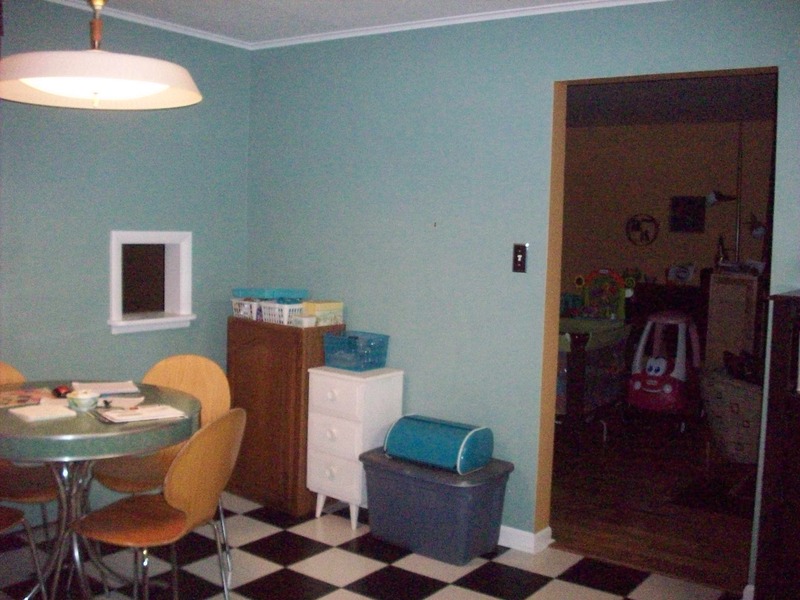 In our hot and humid Midwest summers my kitchen was just not as cool as the rest of our home. He also had to update the old cast iron plumbing in our main bath, where our washer and dryer will be located. As you know, we have tried to re-use “original” as much as possible and in the hall bath we kept the cabinet doors that were taken off of the wall of built-ins, had them cut down and used them for the vanity. 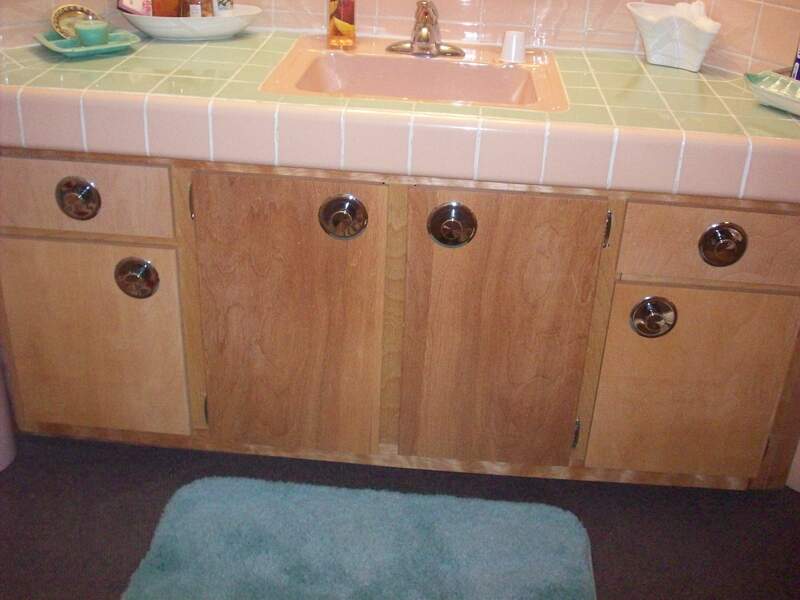 We kept the old kitchen cabinet hardware and reused it in the bath. I think it looks pretty good! Hubby added shelving and made doors for the top area (which was non functional). I now have more storage! The kitchen is still in the demo stage. This is a little unnerving, as my crock pot sits in the bedroom and the disposable dishes are sitting by the fireplace in the living room. This doorway to the 3/4 bath is being closed up and moved around the corner into the knotty pine mudroom. This change will give me a better working area for the kitchen. Besides I don’t really think you should see into the bathroom while sitting at the kitchen table. This center post is also being taken down to help with the flow of the room. There will be shallow base cabinets and uppers where the washer/ dryer are now. This wall will be partially opened up for a bar/ serving area in the living room. We will have a great view of the fireplace from the kitchen! We will be installing IKEA cabinets and appliances. We have purchased Armstrong VCT flooring in retro aqua, gray and charcoal. Wilsonart laminate counter tops are being made in a few new throwback patterns so we have picked “Betty”. We will also be adding retro sputnik lighting. A great seller on Etsy supplied me with 20 yards of vintage atomic bark cloth fabric for window coverings.